Great white shark, the shark we love to hate. Because it’s Shark Week on the Discovery Channel, this week’s Friday Fiction Facts is about sharks. But before I give you the science facts, I want to make a very strong point. If you are thinking of adding a shark to your story for the sole purpose of having it attack or kill someone, please don’t. First of all, that’s cliché’ and you are supposed to be a better writer than that. But more importantly, how you portray sharks affects living animals. Sharks are one of the most maligned creatures on earth (right up there with those rattlesnakes I blogged on earlier.) In books and in the press, nearly every reference to sharks is sensationalized. The creatures are portrayed as eating machines, automatons, animals whose only drive is to kill. This barbaric practice (along with unregulated and poorly managed fishing practices) is having a devastating effect on many shark species and the ocean ecosystem. Do you realize there are only about 3500 great white sharks left in the entire ocean? Yup, that’s it. At that rate, a person would have to try pretty hard to be eaten by one. 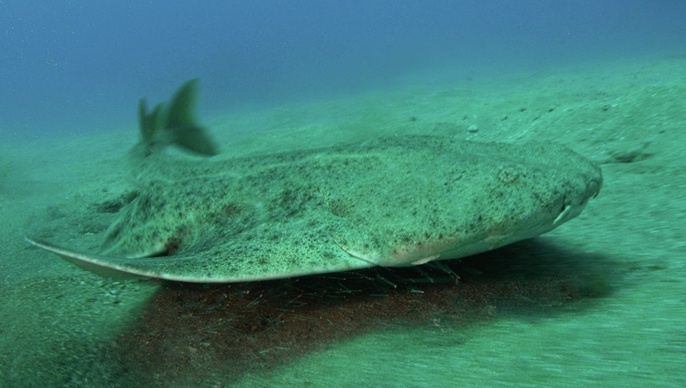 The angel shark will only bite if you step on it. The word “shark” is generic. As a writer, you know that “Marisa jumped into her Mercedes” tells your readers a lot more about Marisa than does, “Marisa jumped into her car.” Same goes for animals of all types. If you are to include a shark, get it right. Different species swim in different waters. Do your homework, learn what sharks inhabit the ocean where your book takes place, how those sharks behave (including how they hunt and what they eat), and then refer to them correctly. Never use the cliché, “shark infested waters.” Sharks do not infest water. They live there. Do not refer to sharks as “man-eating” or “having a taste for human blood.” Sharks are predators. They eat meat. They are also opportunists. Sometimes humans find their way into the realm of sharks and a shark decides to see if this creature is edible. More often, they just swim on by. 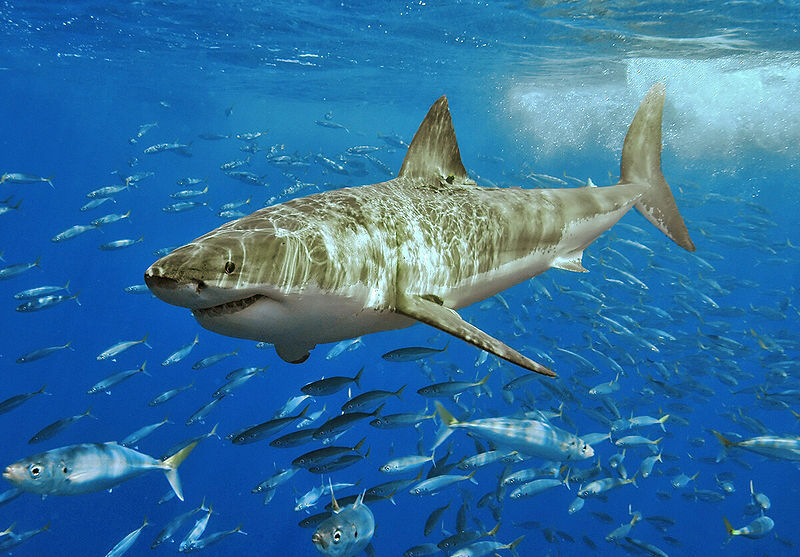 Christopher Neff, at the University of Sydney, Australia, suggests that the term “shark attack” should be dropped altogether since research shows that many bites are investigatory or defensive. Sharks are fish, but they are different from other fish in that they have no bones. They do, however, have skeletons made of cartilage. Cartilage (like the stuff that makes the tips of your nose and ears) is lighter and more flexible than bone. Unlike other fish, the shark does not have a swim bladder for buoyancy, so the lightweight skeleton helps the shark to maintain neutral buoyancy. It also gives the animal greater overall flexibility and maneuverability. However, a cartilaginous skeleton offers little support outside of water, so a large shark may be crushed by its own weight if dragged onto a boat or land even for a short time. Most sharks have good senses of hearing, smell and sight. Their eyes, like those of cats, have tapeta lucida, allowing them to see well in dark or murky water. Their sense of smell (chemoreception) is also very keen. Tiger sharks, for instance, can smell dead fish or other dead animals from very long distances, and follow the odor to its source. Sharks can detect weak electrical fields at short range (inches) through small vesicles and pores that form part of an extensive subcutaneous sensory network called the ampullae of Lorenzini. 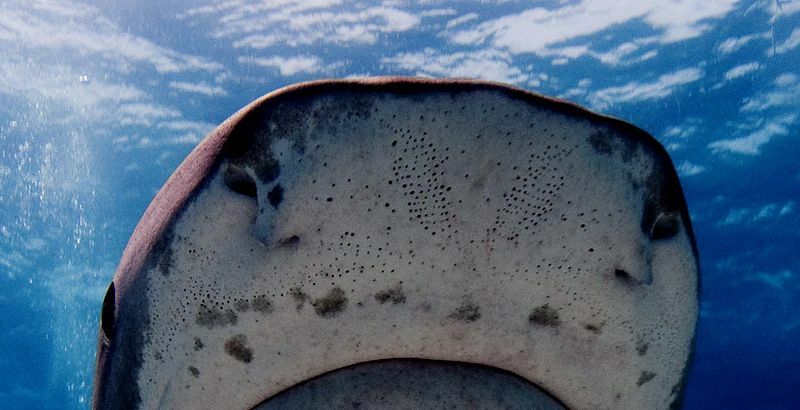 The pores can be seen around the sharks nose and mouth and are used to help the shark locate cryptic prey under the sand. Sharks, like other fish, also have a lateral line system running the length of their bodies. This system is also open to the water by way of pores. It allows the shark to detect sound, vibration, and pressure changes in the water from all sides. If movies are to be believed, every shark is at least 20 feet long (Look! 35 feet!) and they all attack people in a frenzy of blood and dismembered limbs. In reality, there are 400 species of sharks. 80% are under 6 feet long and 50% are under 3.5 feet long. Not exactly the stuff of Hollywood legend. Only four shark species have been involved in a significant number of fatal unprovoked attacks on humans: the great white, tiger, bull and the oceanic whitetip. While considered less dangerous, other species have also been known to bite humans. A brief (and very unscientific) look through some shark fatal shark bite statistics also showed me that many are cases where a person fell or was swept into the sea and their body, showing evidence of shark bites, was recovered days later. Perhaps they were not “shark attack” victims at all, but were drowning victims whose bodies were later scavenged by sharks. Hit-and-run attack – Usually non-fatal, the shark bites and then leaves; most victims do not see the shark. This is the most common type of attack and typically occurs in the surf zone or in murky water. Most hit-and-run attacks are believed to be the result of mistaken identity. Sneak attack – The victim will not usually see the shark, and may sustain multiple deep bites. This is the most fatal kind of attack and is not believed to be the result of mistaken identity. Bump and Bite attack – The shark circles and bumps the victim before biting. Repeated bites are not uncommon and can be severe or fatal. Bump-and-bite attacks are not believed to be the result of mistaken identity. I will leave you with that, and hopefully with second thoughts about using a “killer shark” as a plot device. Remember, every book, article, blog post, and sensational headline that paints sharks as nothing more than killing machines, adds to the plight of these immensely beautiful and important ocean creatures. *Important Note: “Finning” only refers to the removal of shark fins on the boat, while the shark is still alive. In the case of finning, the shark’s body is considered waste and thrown back into the ocean. Finning is illegal (although still practiced) in many countries. 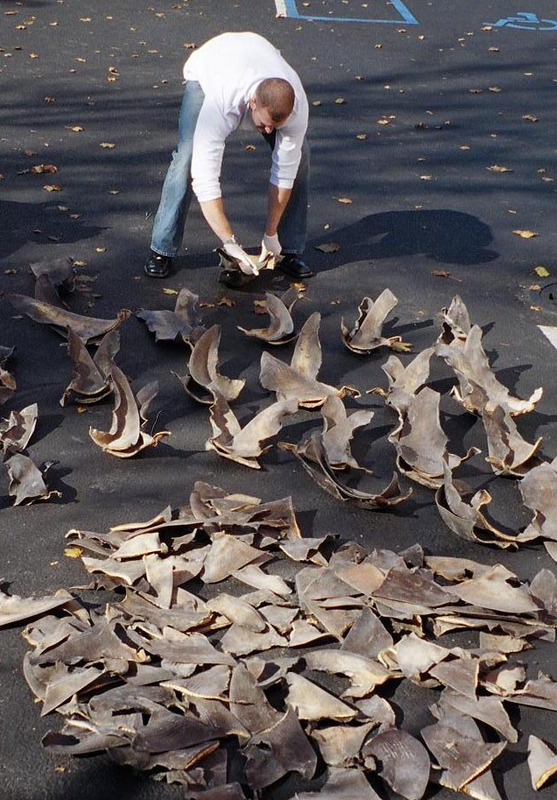 However, some shark fins are obtained through legal shark fishing methods. In these cases, the fins are removed after the shark has been killed and the rest of the shark is also used. NextFriday Fiction Facts: Ladies & Gents, The 4th Dimension!